Business Office Room 4, UH, Tel. X 2811 All payments for tuition, dormitory and fraternity room and board bills, and any University expenses are paid in the Cashier's Office. If you are employed by the University, pay checks are distributed in that office also. Mr. Waldo Geiger, Auditor of Student Organization Accounts, advises student organizations on all financial matters, orders tickets, and prepares vouchers and requisitions for student groups. Iowa Memorial Union. 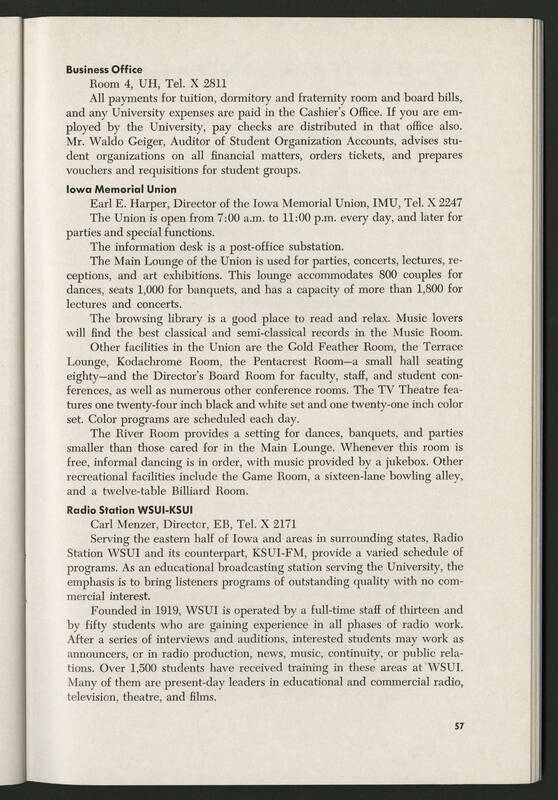 Earl E. Harper, Director of the Iowa Memorial Union, IMU, Tel. X 2247 The Union is open from 7:00 a.m. to 11:00 p.m. every day and later for parties and special functions. The information desk is a post office substation The Main Lounge of the Union is used for parties, concerts, lectures, receptions and art exhibitions. This lounge accommodates 800 couples for dances, seats 1,000 for banquets, and has a capacity of more than 1,800 for lectures and concerts. The browsing library is a good place to read and relax. Music lovers will find the best classical and semi classical records in the Music Room. Other facilities in the Union are the Gold Feather Room, the Terrace Lounge, Kodachrome Room, the Pentacrest room - a small hall seating eighty - and the Director;s Board Room for faculty, staff and student conferences, as well as numerous other conference rooms. The TV Theatre features one twenty four inch black and white set and one twenty one inch color set. Color programs are scheduled each day. The River Room provides a setting for dances, banquets and parties smaller than those cared for in the Main Lounge, Whenever this room is free, informal dancing is in order, with music provided by a jukebox. Other recreational facilities include the Game Room, a sixteen lane bowling alley and twelve table Billiard Room. Radio Station WSUI-KSUI Carl Menzer, Director EB, Tel. X 2171 Serving the eastern half of Iowa and areas in surrounding states, Radio Station WSUI and its counterpart, KSUI-FM provide a varied schedule of programs. As an educational broadcasting station serving the University the emphasis is to bring listeners programs of outstanding quality with no commercial interest. Founded in 191, WSUI is operated by a full time staff of thirteen and by fifty students who are gaining experience in all phases of radio work. After a series of interview and auditions, interested students may work as announcers, or in radio production, news, music, continuity or public relations. Over 1,500 students have received training in these areas at WSUI. Man of them are present day leaders in educational and commercial radio television. theatre and films.